Healthcare along with professional and business services led the charge with 49,000 and 37,000 respectively. Of professional and business services’ total, management and technical consulting services contributed 6,000 of the new jobs. With jobless rates at historic lows, attracting capable and competitive talent forces employers to offer either full-time positions or higher wages. Or both. Plus perks. While wages increased (up 3.2 percent YOY), so did employer benefits. Julia Pollack, a labor economist with ZipRecruiter reported that in March, 34 percent of its job postings offered benefits, a 19 percent increase YOY. Higher wages provide workers greater purchasing power. “This means households and workers have pretty strong purchasing power and they can spend more at the mall,” Beth Ann Bovino, United States chief economist at S&P Global Ratings told The Times. Steady, incremental wage increases and resulting consumer spending could provide both ballast and buoyancy to the economy in the coming months. Sector Job Growth from the B.L.S. Industry Job Growth from the B.L.S. Do you know what to pay top talent? Check out the most accurate salary data for specialty professionals in your job market and across the country. 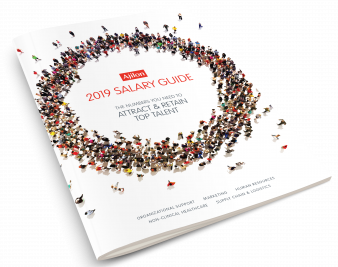 Get your copy of our latest Salary Guide. The BLS defines a sector as a subset of the domestic economy and excludes the economic activities of the following: general government, private households, and nonprofit organizations serving individuals. A sector consists of multiple industries. The BLS defines an industry as a group of establishments that produce similar products or provide similar services. Multiple industries makeup sectors. Let's talk about your recruiting situation.